Android One was supposed to be pure Android for the masses (since the Nexus 6 and 9 went premium). However, it was got the cold shoulder from consumers, which caused Google to rethink its strategy (both one One and Nexus). So, now we have the General Mobile GM5 Plus - an Android One handset with (the equivalent of) a $300 price tag and mid-range phablet specs. A far cry from the entry-level, sub-$100 phones that the platform originally targetted. If you shake the pre-conception of "Android One = entry level," you'll find the GM5 Plus is actually a very appealing device. The phone has a metal frame and a textured plastic back. It has a 5.5" screen with 2.5D Gorilla Glass 4, the screen has 1080p resolution. Above the screen is a 13MP selfie camera with autofocus and dedicated flash. There's a similar 13MP camera on the back (with dual-flash). The camera has been tuned with DxO. As any Android One, the phone runs a very fresh 6.0.1 Marshmallow software. The chipset is a Snapdragon 617 with 3GB of RAM and 32GB storage if you need more there's a microSD slot. Connectivity includes USB Type-C with Quick Charge 3.0 (60% battery in half an hour). The battery is 3,100mAh by the way. Anyway, the Qualcomm chipset supplies LTE Cat. 7 - 300Mbps down, 100Mbps up - and Wi-Fi ac. 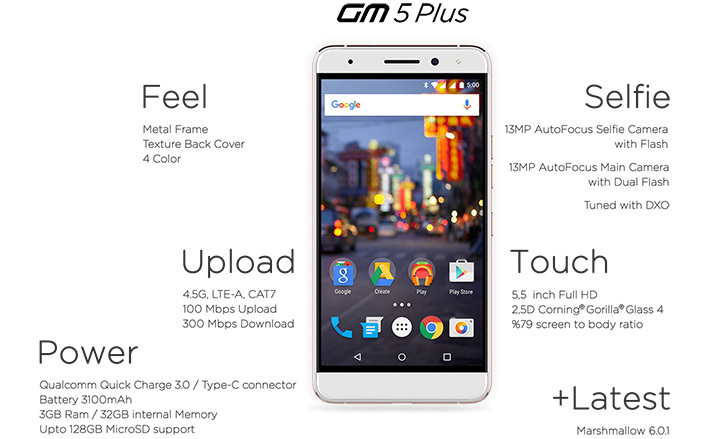 The General Mobile GM5 Plus will be available internationally. GM is targeting 15 markets after it launches in Turkey. The price will be equivalent to $300. I have used this mobile for 1 year. it is a good phone. I am using GM 5 Plus for one year and I am very satisfied with this. I highly recommend as it is very good.